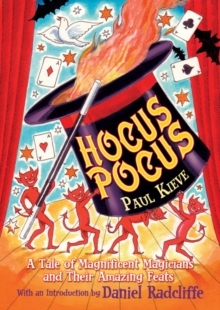 Ever since the author Paul Kieve was given a magic set at the age of ten, he has been buying magic books, props and posters and honing his skills as a magician. He keeps all his magical paraphenalia in his house in Hackney, right around the corner from the magnificent Hackney Empire, a venue played at by all the great illusionists of the golden era of magic, some hundred years ago. One day, as Paul is on the phone to his friend, sitting in his 'Poster Room', chatting to a friend about how well his magic show went from the night before, he gets a strange sensation ...Suddenly, the huge figure of Alexander steps out of the poster and starts telling Paul off for getting too big-headed! Alexander and the other brilliant magicians in the posters are going to show Paul what magic is really about!